As CUGA®Sequencing System applies in vitro transcription using RNA polymerase, you need to add promoter sequences into the 5' end of your template DNA. The list of promoter introduction methods to your target DNA is as follows. In the preparation method of the template DNA by PCR, you can bring the PCR cocktail to the sequencing reaction stage directly without a purification step. Therefore, you can dramatically reduce the time needed to go from DNA preparation to sequencing. To use the PCR product as a template for Transcriptional Sequencing, you have to add the promoter sequences (see Figure 1) to the 5' end of your template DNA. Also, if you amplified your target DNA using PCR with promoter-attached primers, you can get the template DNA with T3, T7 promoter sequences on both sides of your target DNA. Then it is possible to analyze your target DNA from both sides using CUGA®3, CUGA®7 RNA polymerases. 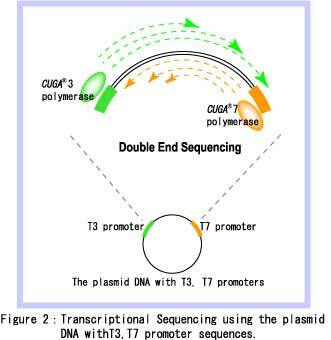 Because CUGA® Sequencing System applies in vitro transcription using CUGA®3 andCUGA®7 polymerases, you need the plasmid DNA with T3 and T7 promoter sequences in CUGA® Sequencing. However, base-calling started at 50 bases from the initiation site and there are some uncertain areas in the 5' end sequences using the current plasmid DNA with promoter sequences. To make up for the defect, we developed the cloning vector arranged specially for Transcriptional Sequencing; "pTS1". You use it with theCUGA®Sequencing Kit, and you will get an excellent result reflected in the accuracy of your data. Moreover, it also can be used for Cycle Sequencing. If you use pTS1 in your cloning step, you can have the choice of using Cycle Sequencing or Transcriptional Sequencing depending on the method you like. There are some methods of preparing plasmid DNA but standard methods is available for Transcriptional Sequencing. However, add RNase-treated step first and add phenol-treated step after that to lose its activity. CUGA® is a registered trademark of Nippon GeneTech Co.,Ltd. in Japan.